We are home again after a fast trip to Virginia for the wedding of our cousin. It was a beautiful celebration. I just went through my photos and there were some moments and details that I wanted to remember. I thought I'd share some of them with you. Sometimes looking at pictures can be very inspirational for other projects. 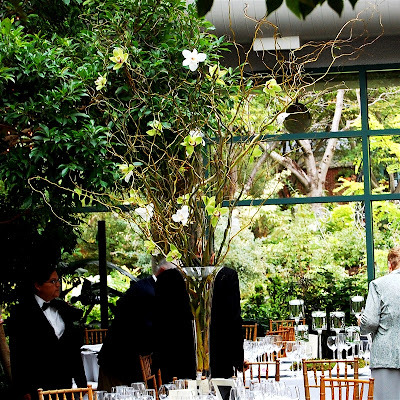 The wedding and reception took place at a Botanical Garden. It was a lovely setting and very intimate since the building can accommodate only a limited number of guests. The tables had amazing arrangements of branches with orchids or reeds and floating candles. 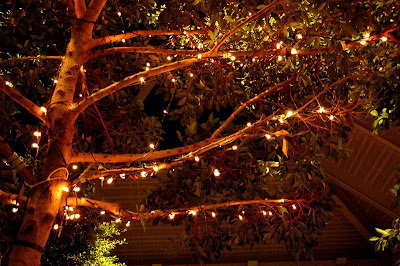 The ceremony was in the late afternoon and as the day turned to evening the tiny lights in the indoor trees and the candles gave a magical effect to the room. This sign greeted us at the entrance. The hot pink and green colors were perfect together. The artwork was done by another cousin, Juliana Bright. 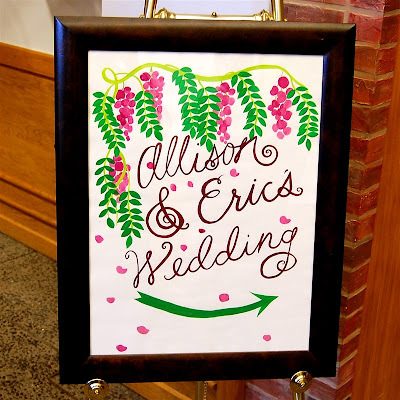 She created all of the wedding stationery, including the wonderful and colorful save the date card. You can see some more of Juliana's artwork and illustrations HERE. 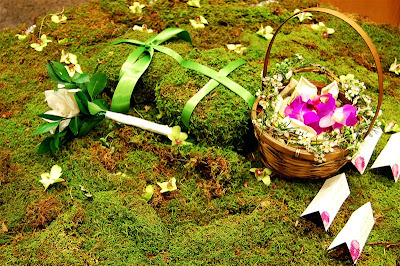 The ceremony combined many traditions from different parts of the family. 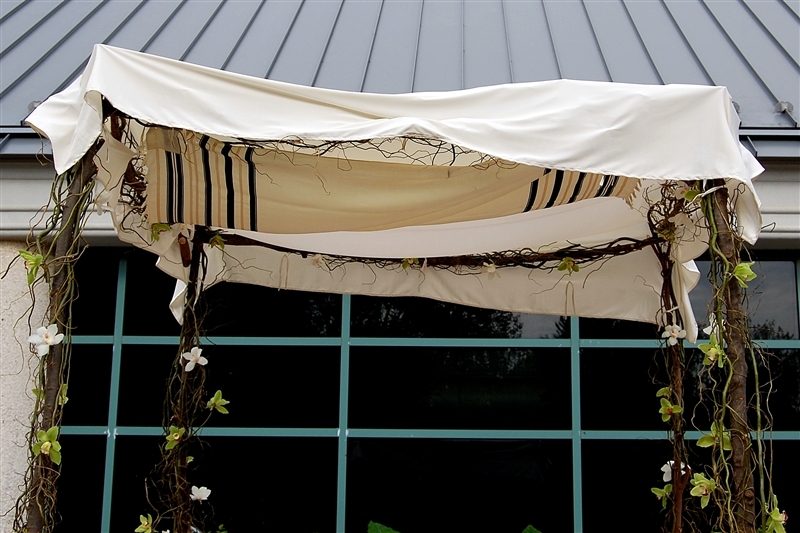 A wedding canopy incorporated the prayer shawl from a great grandfather from the bride's mother's side of the family. 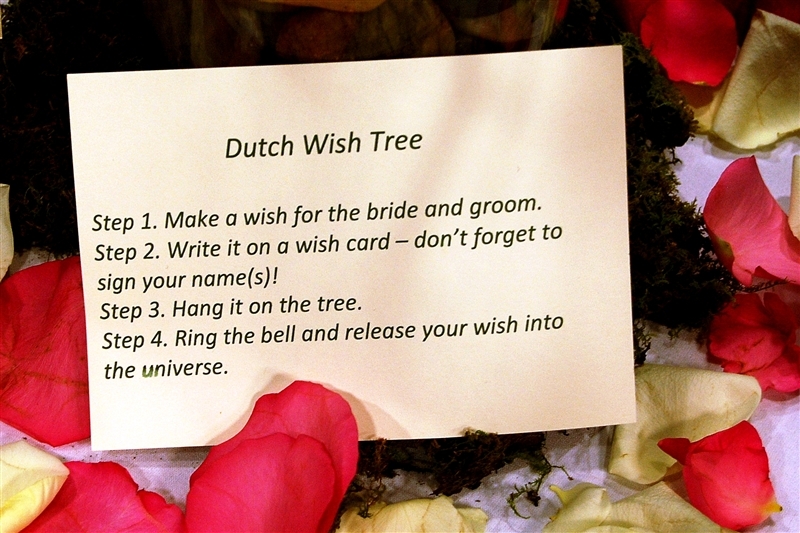 This Dutch wish tree was a special place to leave a message for the bride and groom. Here are the directions for the wish tree. The ringing of the bell for each wish was fun to hear. The tags were simple stamped tags but you could make more elaborate tags with lots of different Cricut cartridges. The tree filled up as the evening went on. 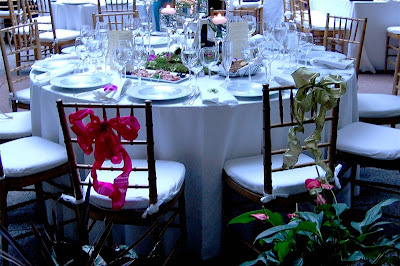 The tables all had a very natural look with moss for the base of the centerpieces. 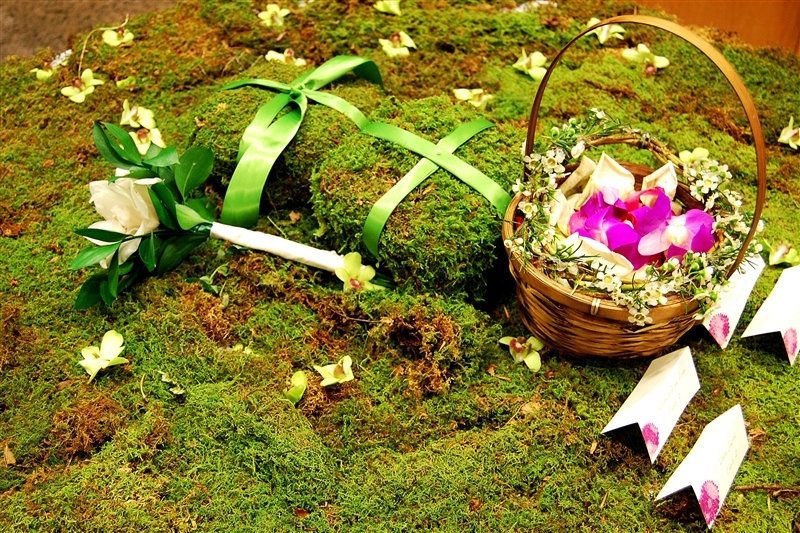 The place cards were also set out on a mossy table and the ringbearers carried the rings tied on these moss cushions. 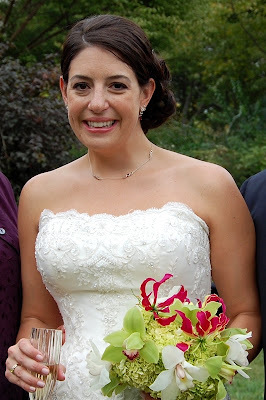 Allison was a beautiful bride - here she is with her colorful bouquet shortly after the ceremony. Her long hair was carefully arranged in loose curls with sparkly hair ornaments that really caught the light. 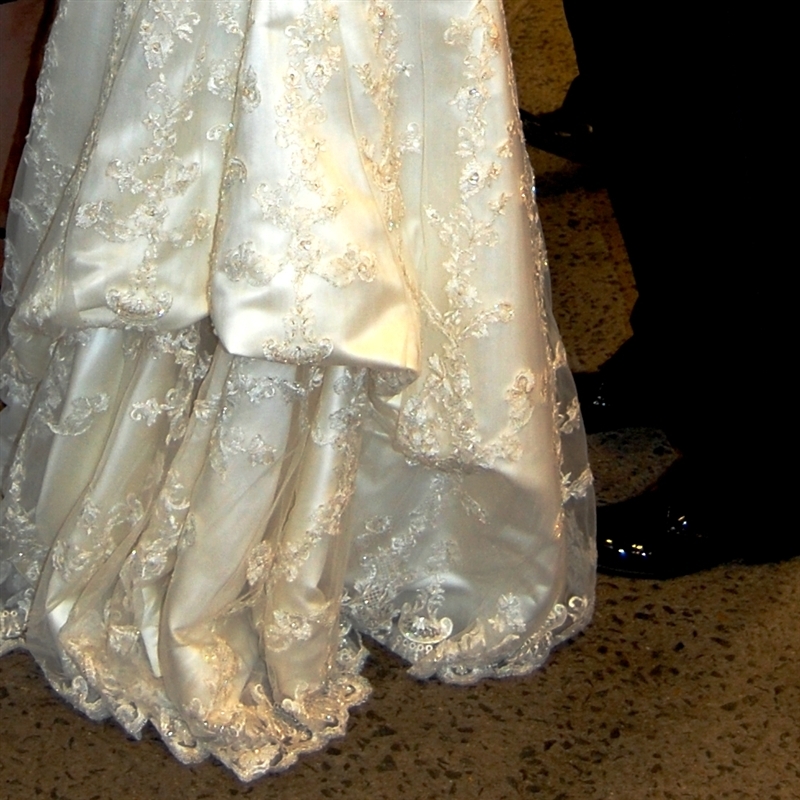 Her gown was made with lots of beading and lace and the train gathered up beautifully for the reception. Most of the attendants were children and they looked adorable with their crowns of flowers. 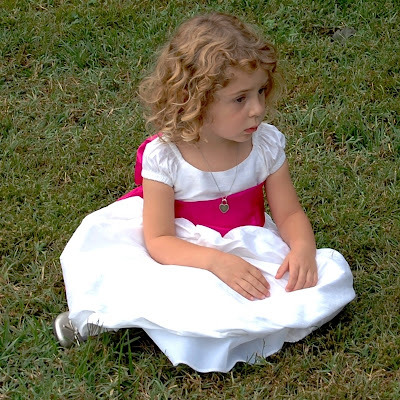 This was after the ceremony - I think she was a little bit tired. 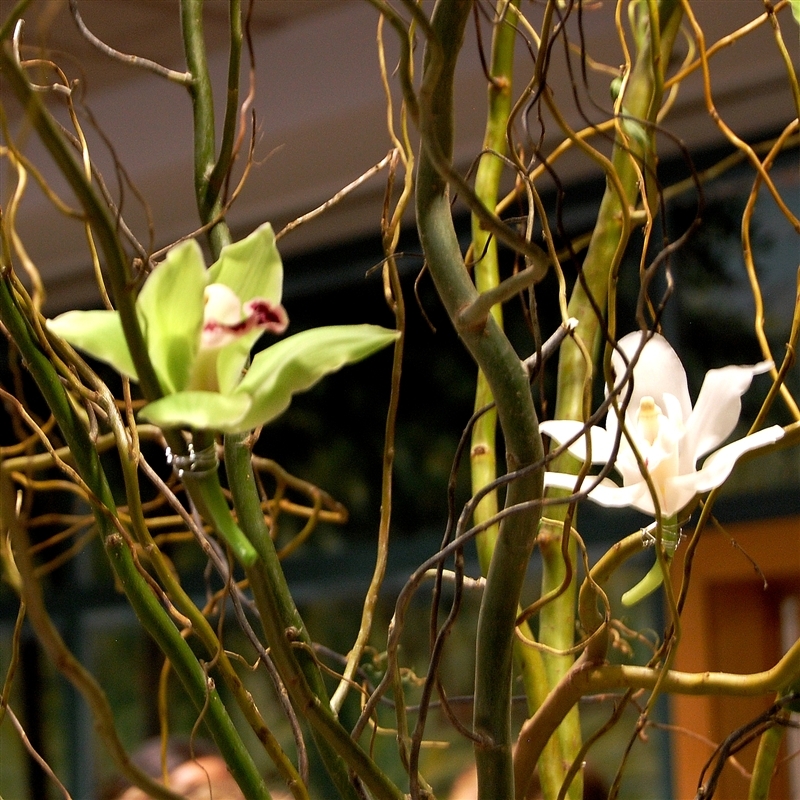 The branches with orchids were so lovely and really tied all of the colors together. 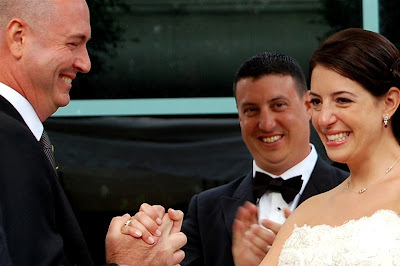 This was taken right after they were pronounced husband and wife. Allison's brother Jon served as her honor attendant and you can see how happy they all are in this photo. His son and daughter were two of the children in the wedding. 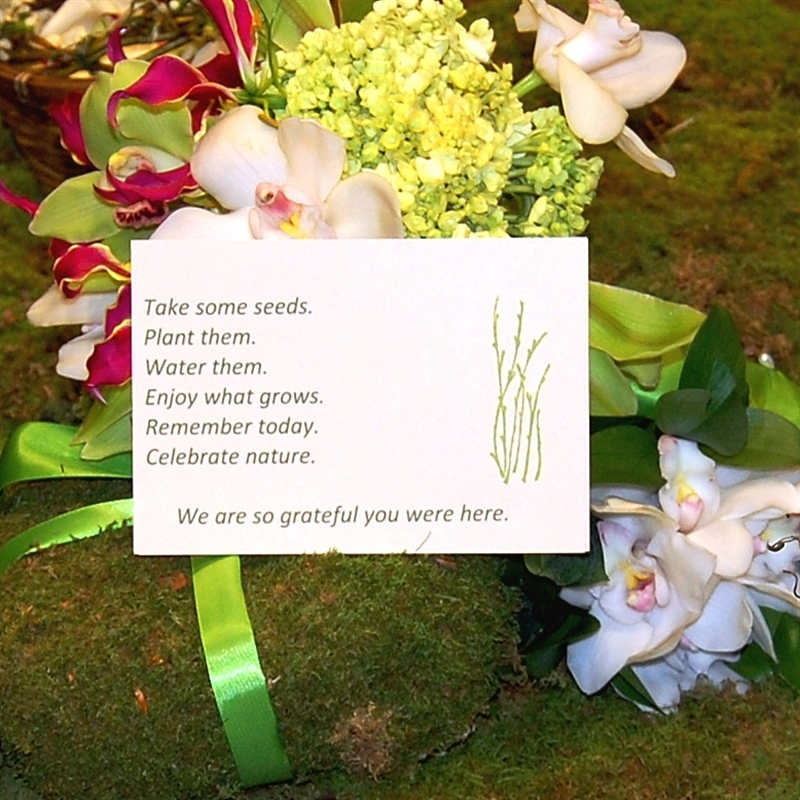 As we left the reception there were packets of wildflower and other seeds for us to take and this card of thanks. 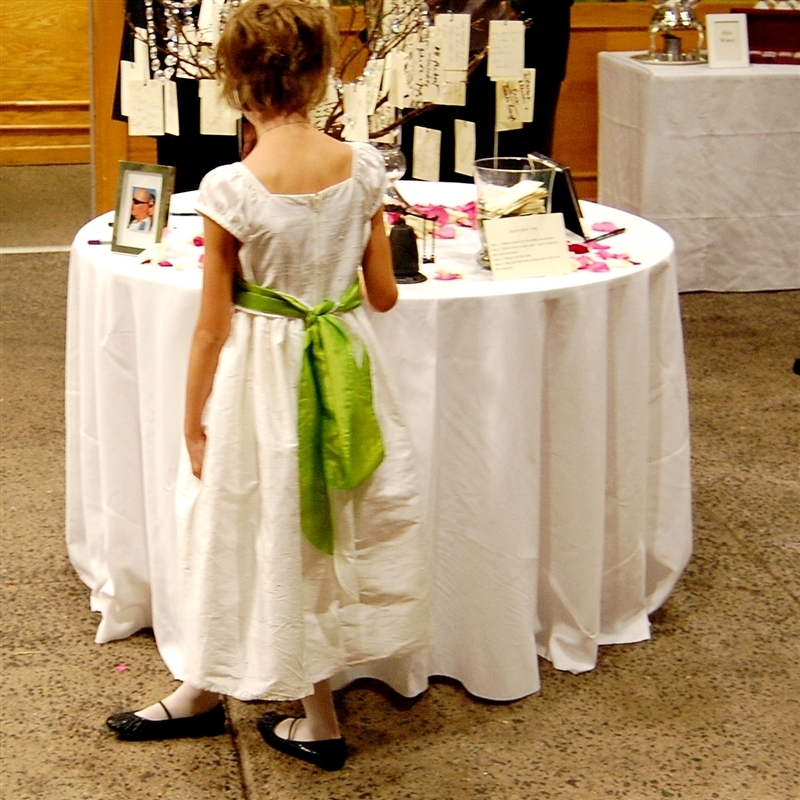 It was a very special occasion and we were so glad to see our flower girl married to such a wonderful man. We wish them many years of happiness together. Tomorrow I'll be back to "crafty" posts again. I did have my Gypsy on the plane with me and have several things ready to test cut. What a special wedding and such a beautiful bride!! TFS! 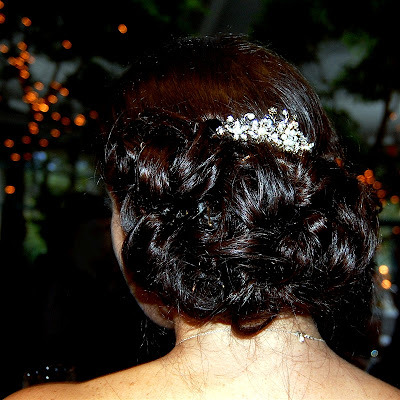 Thanks for sharing your beautiful photos of the wedding! Your blog is always a joy to read! How beautiful. Thank you for sharing the photos. Allison was indeed a beautiful bride. The botanical garden was a fabulous setting!! I love weddings. Beautiful photos...what: no cake? 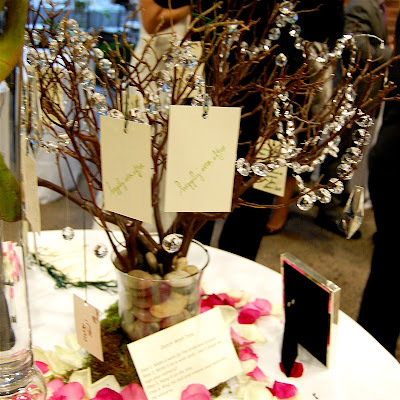 Stunning bride and wedding photo's, love the idea of the wish tree and the taking of the seeds at the end. Can't think of a better way to remember a wedding unless of course you scrap it lol. 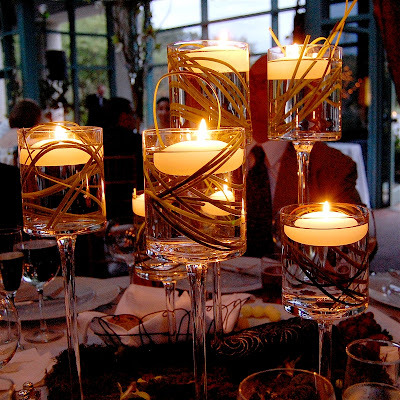 beautiful photos and wedding. i'll take the idea of seed pkgs for the guest for my next wedding plans i'm sure to be asked to help with. 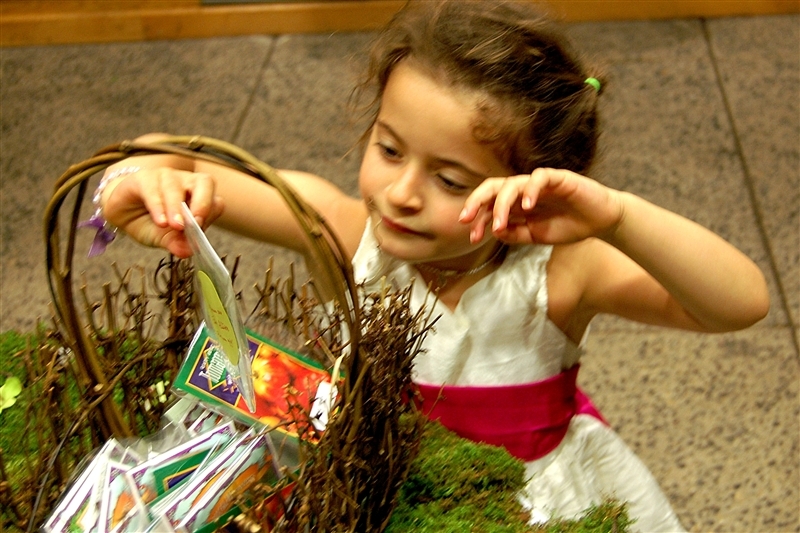 a big bag of wildflower seeds packed into seed packets. i'm sure i have a cart somewhere to make them. What a most marvelous bunch of photos. 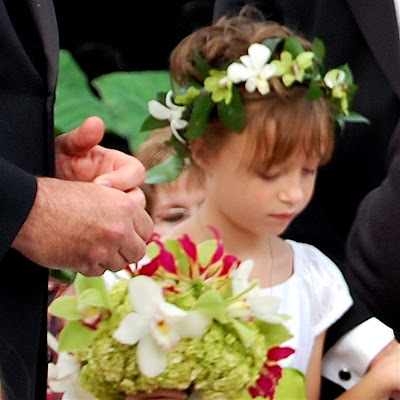 Thank you for sharing her special day with us.